As we mark the final day of spring classes, I write with news of new beginnings, new roles and renewed responsibilities. Names involved in these leadership transitions include some familiar ones – Derryl Block, Gerald Blazey and Matt Streb – and some new faces to our campus: Donald Russell Peterson, Frederick D. Barnhart and Sol D. Jensen. Pending approval from the Board of Trustees on May 18, Derryl Block, who joined NIU in 2012 as dean of the College of Health and Human Sciences, will be reappointed for another term. Using a collaborative leadership style, she has effectively used and developed resources through strong working relationships on- and off-campus, connecting with alumni and friends of the college, promoting innovation, ensuring educational quality and facilitating research through initiatives that included repurposing of funds. She has led the work to revise, realign and enhance programs, especially pre-professional programs, to better serve students. She also has shepherded extensive curriculum and organizational changes to improve student retention and program marketability to potential students. Gerald Blazey has been named vice president of the Division of Research and Innovation Partnerships. As we announced April 11, Jerry rose to the top of a national pool of excellent candidates to assume permanent leadership of the division he guided in an interim role for two years. His appointment was approved by the Board of Trustees yesterday. His scholarly research in physics, career accomplishments, experience working in our nation’s capital and understanding of the federal funding process have prepared him well for this important leadership position on our campus, and I believe that VP Blazey is uniquely qualified to lead and strengthen our position as a nationally recognized public research university. Matt Streb, former chair and current professor in the Department of Political Science, will replace Associate Vice President Mike Mann who is retiring this month after serving as our Board liaison and state legislative liaison. Matt will also do strategic project work in the additional role of chief of staff. Matt’s leadership has served the university in many important capacities including most recently as co-chair of the Program Prioritization Administrative Task Force and the ongoing work to facilitate complex conversations, all while being the faculty athletics representative. Serving as a liaison between the president, the board, the executive staff, the cabinet, the academic units and staff, Matt will facilitate strategic, effective-decision making while maintaining a close working relationship with the Illinois Board of Higher Education, the Governor’s Office of Management and Budget, the Illinois General Assembly the Capital Development Board and more. We also welcome three new leaders to our campus, pending approval from the Board of Trustees on May 18. Donald Russel Peterson has accepted an offer to become dean of the NIU College of Engineering and Engineering Technology, beginning July 1. He is currently a professor of Engineering at the College of Science, Technology, Engineering and Mathematics at Texas A&M University-Texarkana, where he served as dean from 2014 to 2016. Previously, he served as chair of the Biomedical Engineering Department at the University of Connecticut. As an accomplished scientist-administrator, with experience in education, research and business innovation, he has 21 years of expertise in engineering and medical research. 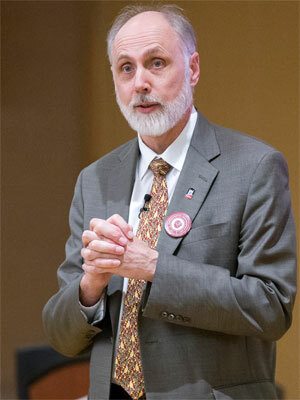 Frederick D. Barnhart has accepted an offer to become dean of the NIU University Libraries, beginning July 1. He is currently serving as the associate dean for Library Services and Collections and as acting assistant dean of Technical Services at Loyola University in Chicago. Previously, he served that institution as interim dean for University Libraries. He is a strong advocate for diversity, equity and inclusion, helping to develop programs and resources to support faculty, staff and student diversity. His publications and presentations focus on the changing roles of academic libraries. Sol D. Jensen has accepted an offer to become vice president of the Division of Enrollment Management, Marketing and Communications, beginning June 19. He comes to NIU from the University of North Dakota, where he has served as assistant vice president of Enrollment Services since 2013. He spent the previous decade at Washington State University, where he began as a regional admissions counselor and rose to executive director of Enrollment Services. His career in higher education began in 2000 at William Penn University in Oskaloosa, Iowa. We’ll also post our open Vice President for Administration and Finance position in the coming days and hope to have that search complete by early fall.